Derby season is the ideal time to be Kentucky proud and remember that our acclaimed culinary reputation has its roots in our farming traditions. These five featured chefs haven’t forgotten where the seeds of our foodie scene were planted. “Growing up on the farm was wonderful and very special. I was so lucky. We had lots of freedom and were surrounded by the beauty of the land and animals. It is still very dear to my heart,” says Kathy Cary about Longfield Farm in Prospect. Kathy is lauded as one of the chefs, if not the chef, who was instrumental in bringing farm-to-table to Louisville. 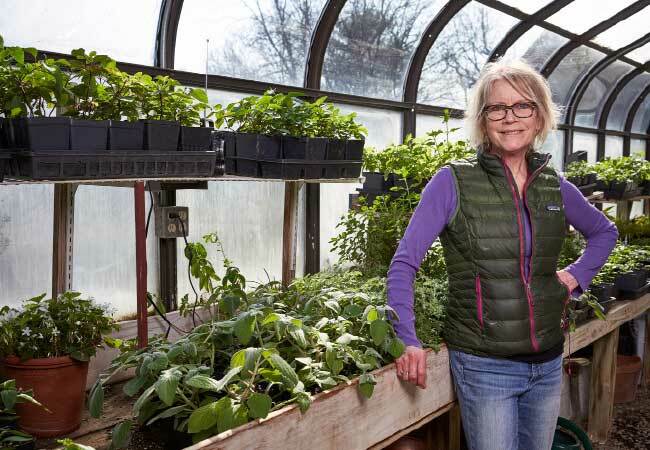 She credits the 300-acre, all organic farm with instilling in her the love of growing much of the food she serves at her restaurant, Lilly’s Bistro. “It’s how I got into cooking – the joy of planting, watering and watching something grow, the reward of picking it from the garden and coming back to the restaurant and making a dish. You feel like you’re part of nature, part of the story, and of what people will eat and feel rewarded by your hands,” she says. Maintaining the farm is what she describes as a plural effort. Someone helps with her mother’s flower garden-- the mowing, horses and soy bean acreage. “The vegetable garden, that’s little old me,” she says. Her sister Louise is tasked with coordinating everyone. Cary looks through catalogs and visits nurseries to select seeds that are challenging and fun to grow. Her garden produces heirloom and classic tomatoes; Thai, jalapeño and banana peppers; cucumbers; baby eggplant; asparagus; broccoli; cauliflower; and herbs, the main one being basil because Lilly’s uses it in large quantities. “The squash went berserk last year, like A Little House of Horrors. I plant it in its own area because it’s pretty wild,” she says. Haricots verts aren’t as unruly, growing easily up a wire fence. Last year she used the squash in squash soup she made with Kenny’s Cheddar. The eggplant? In eggplant Parmesan. About the tomatoes, she says plain is best. “Sometimes I have an overwhelming number of weeds. Some of the plants don’t mind weeds. I don’t really care how the garden looks. I’m not a perfectionist. It’s all about what it produces,” says Cary. Although his parents had a small garden and he had a summer job laying irrigation pipes for tobacco fields in Harrison County, Tyler McNabb had little actual gardening or farming experience. That changed when he joined Holly Hill Inn. McNabb, chef de cuisine, and other members of the kitchen crew tend the herb garden at Holly Hill. They grow rosemary, oregano, lavender, bay leaf, two kinds of sage, curly and flat leaf parsley, chives, tarragon, dill, basil and three varieties of thyme: lemon, standard and spicy orange. “It’s much more satisfying to walk out the back door of the kitchen to snip chives or lavender buds rather than opening up a plastic bag that was delivered from miles away. We use the garden as much as we can. For being a small garden, it produces a lot for us,” says the chef. The herbs usually provide complementary notes but play a more prominent role in Holly Hill Inn’s head-on trout stuffed with shrimp and corn bread, smoked mussels or cray fish, and topped with a sauce gribiche full of tarragon, chives, dill, parsley, lemon thyme and hard-boiled eggs. Behind Holly Hill Inn is a garden that belongs to Mike and Amy Perry. McNabb and his staff help the Perrys with peppers, tomatoes, squash and beans. 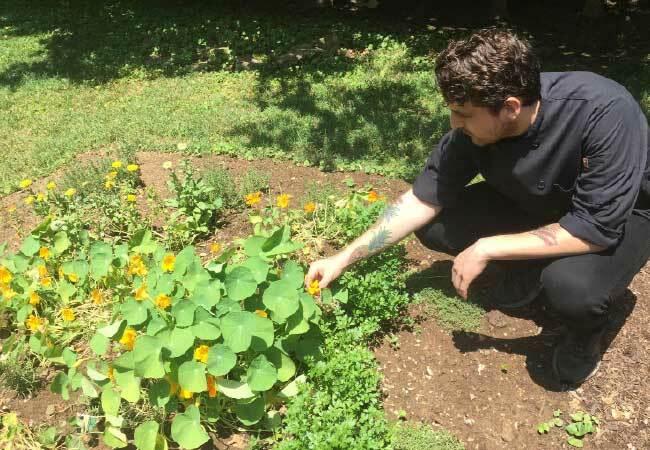 McNabb says, “We use the squash for soups, but we really look for the squash blossoms. They’re my favorite things from the garden even though they tend to have little non-flying insects that like to live inside the blossoms. Rinsing each individual blossom by hand is kind of a chore.” He pan fries the squash blossoms in an egg white batter and tops them with lemon herb sauce, romesco or pepper jelly. Last year he created a pissaladière, a handmade tart with melted spring onions, chives and leeks, and topped it with wilted squash blossoms. “It was sad when a couple of years ago the entire lemon balm crop got mowed down by accident. In hindsight it was funny, but we were all peeved at the time. Now it is flourishing,” he says. Laura Lee Brown and Steve Wilson, owners of 21c Museum Hotel and Proof on Main, purchased the more than 150-year old Woodland Farm in Goshen in 1996. Today, Proof on Main Executive Chef Mike Wajda has the enviable job of featuring many of the farm’s products in dishes that have won accolades from local and national press and visitors from around the world. Having such ties to a farm comes naturally to him. When he was younger, he helped out on a farm in a small town and was involved with tending his family’s garden and canning and preserving peaches and apples. Perhaps watching his mother make her own tomato sauce was inspiration to his becoming a chef. Among produce that’s on the agenda for this year are rhubarb, peas, tomatoes and parsel. Bucking the avocado toast trend, Wajda will instead use the peas on toast. And he plans to make rhubarb filling to cut the richness of the chicken liver pâté in his adult pop tart. Rhubarb pie lovers, don’t despair. There will be plenty of rhubarb for pies. In 2006, Josh Moore bought a 10-acre property in Taylorsville, not for the land but for the farmhouse. That year he planted 12 tomato plants. Those plants yielded more than he could use at home, so he took them to Volare, where he is partner and executive chef. Buoyed by customers’ reactions to the tomatoes, he planted 50 tomato plants the next year. The following year he added peppers, corn and herbs. What he formerly referred to as the garden, he now calls the farm, which includes a one-acre orchard of fruits and berries, plus two acres of other produce. “We have heavily invested in equipment, including plasticulture, a system widely used in commercial growing. Most small farmers wouldn’t do that but since I have a full-time restaurant career, the investment was worth it to be able to expand what we could grow,” he says. For Moore Farm, the UK agriculture program provided valuable assistance with plasticulture, plant spacing and trellising. Moore and his wife, Lindsay, do all the planting and harvesting. In the spring, they plant lettuces, five types of cauliflower and cabbage, Brussels sprouts, kohlrabi, collard greens, kale and root vegetables such as onions, potatoes, beets, carrots and radishes. 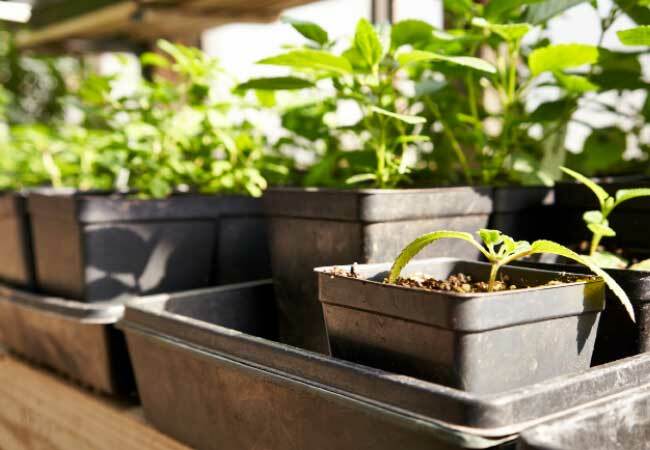 Around Derby, which is extremely inconvenient for a chef, they plant summer crops – ten types of peppers, six varieties of eggplant, “a ton” of different squash, herbs like rosemary, thyme, dill, oregano, lemongrass, cilantro, Italian parsley and three types of basil. Moore uses the sweet Genovese basil in his pesto and in the Volare’s Caprese salad. The fall crop is similar to what was planted in the spring. “We’ve become pretty serious farmers. I enjoy farming. It’s very therapeutic. And serving what we grow is great. We’re truly going from seed to plate. But my true love is being a chef,” says Moore. When Ramsi Kamar was a young boy in Jerusalem, he wanted to be more connected with the earth, to have a farm. That didn’t happen in Jerusalem, but it did in Fisherville, an area that is part of Metro Louisville. The 16-acre, certified organic, Raising Hope Farm, started in 2009 by Kamar and his then wife, Rhona, has been a collaborative effort with Jefferson County Cooperative Extension Service, the University of Kentucky, Western Kentucky University, local government and the National Resource Conservation Service, an arm of the U.S. Department of Agriculture. “At Growing Power, an amazing urban farm in Milwaukee, we attended workshops about microgreens, indoor cropping and greenhouses. I really got hooked on farming at Growing Power. The best thing I came out with was knowledge about composting, a very scientific process,” says Kamar. After buying the field to turn into a farm, the first years focused on infrastructure, such as getting water and electricity to the land. There has been a learning curve to running the farm. “We have learned a great deal and have the burning desire to farm. In the beginning, we grew more than we could harvest or use. We also learned we couldn’t farm without hired hands while we were in the restaurant. We changed our hours so we don’t serve lunch Monday through Thursday to give us time on the farm,” says Kamar. He works the farm while one of Rhona’s most important responsibilities is recordkeeping, that covers statistics including when plants peak and then go downhill. This year they will plant watermelon, tomatoes, green beans, asparagus, radishes, beets and pattypan squash and will build an herb garden that will have mostly perennials. Goji berries will be given another shot at success after previously having been taken outside too soon. Chickens are grown for their eggs and beef will be introduced for the first time. He incorporates the variety of farm products into his diverse menu at Ramsi’s Café on the World. “This is almost a perfect world for me. The perfect world would be homesteading on the farm,” says Kamar.